While the Hollies didn't break through in the U.S. with the same force as the Beatles or the Who, they were still one of the strongest groups of the British Invasion, and their prolific output and constant evolution were as bold as even the most shape-shifting of their peers. 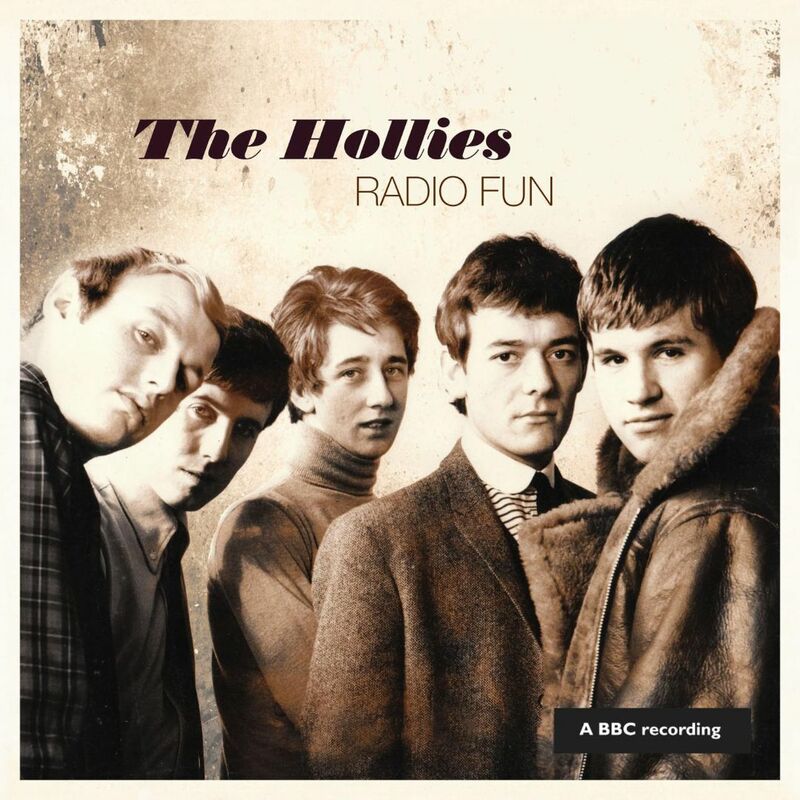 Radio Fun is a testament to the Hollies' ever-changing face as well as their strength as a live entity, collecting a dizzying 32 tracks recorded between 1964 and 1971 for various BBC programs such as Top of the Pops, Saturday Club, and Top Gear. The collection captures the band in its prime, roving from early R&B and Merseybeat-style rave-ups to Everly Brothers-inspired pop harmonies to more rambling rock material as the '60s wore on. Radio Fun isn't presented in chronological order, so the disc begins with the band's light-hearted beat romper "Here I Go Again" from 1964 and jumps ahead four years with the considerably more groovy and psychedelic pop of "Jennifer Eccles." The collection also spans three lineup changes for the group, seeing both bassist Eric Haydock and founding member Graham Nash cycle out of the band over the album's course, the loss of the latter altering the band's sound greatly. 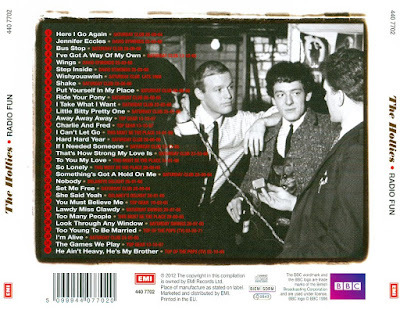 With the exception of "Bus Stop," many of the Hollies' greatest hits are absent from these sessions. 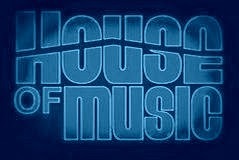 Their blue-eyed renditions of soul classics like "That's How Strong My Love Is" and Sam Cooke's rowdy "Shake" highlight the band's R&B roots, and lesser-known tunes like "The Games We Play" and "Wishyouawish" show the group experimenting with brass arrangements and increasingly complex harmonies. 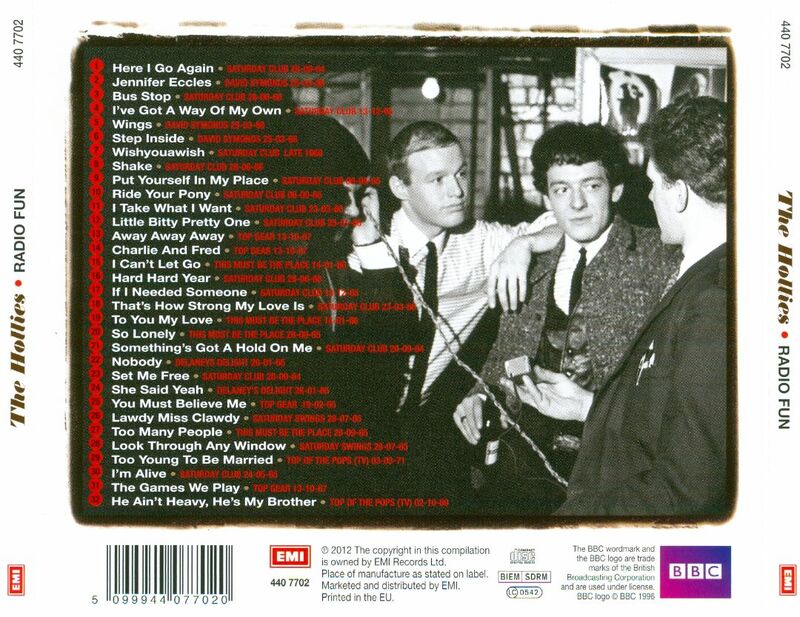 In classic BBC style, a lot of the songs start abruptly, the introductions probably being yapped over by a DJ on the original recordings. The sessions are raw, mostly mono affairs, which works both for and against the overall flow of Radio Fun. It's great to hear the bright harmonies and direct, unproduced performances of the band at its tightest and most hungry. After a while, however, even the most devoted fans might have to take a step away from the collection's incredibly extensive amassment of sounds, which can become monotonous when taken in one sitting. When examined bit by bit, the collection has countless examples of the Hollies' brilliance, with the more obscure later material and most revved-up earliest R&B covers offering a candid picture of a hard-working band having fun in a long-stretching heyday. Fabulous Hollies. All new comps are welcome! Thanks for your efforts. Thank you very much for this. Great to find more Hollies I don't have yet.